Go to the image section of the website. Some photos of the Festival of Sprites are now up for viewing. The 2012 Festival of Sprites was an outstanding event. David & Di Low, Chris & Tina Brine, Helen King, Sue & Helen Stephenson attended along with about 90 other people from all mainland states. Wednesday 25th. We drove all day to get there. Unloaded the cars from the trailers, then down for the ‘Meet and greet ‘drinks’ and a casual meal. Thursday 26th. 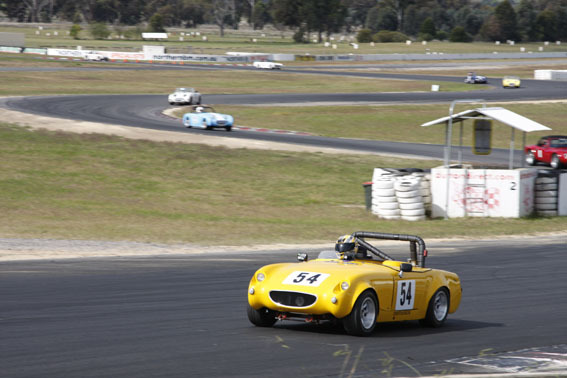 Competition cars went to the Winton track for Sprints and Regularity. 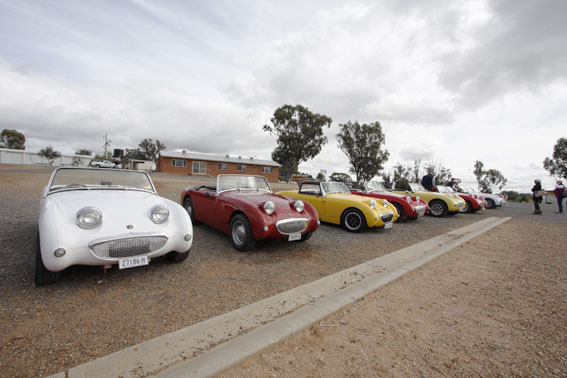 The rest went on an economy run, with lunch at the Winton track. Here we watched the track cars for an hour before setting off on a casual drive around the district. Some went in a bus. I managed 3rd place in the economy run.. That night we had ‘Rocker Cover’ racing. Chris and I entered, but need to do more to win. This is great fun and we need to do it in our Club. Friday 27th. All participants (about 38 Sprites, obviously could not include the unregistered Competition Sprites) went in an economy run to Yackandandah. Here we had lunch provided by the Anglican Church ladies, so it was all home cooked. Then run continued all afternoon, we got a bit lost, but who cares. That night was the Hawaiian night. So all dressed accordingly. Some people love to dress as idiots. That night a recorded interview with Stirling Moss was shown, this was really something special as it can be hard getting him to an interview. Saturday 28th. All the cars lined up for the Concourse. The cars were arranged in a random manner , not lined up in rows. This showed the cars off in a better way and was much easier to take photos.The cars were then judged, but only the best were judged as time did not allow all cars to be judged. I was a judge and was amazed how it was all done. The winning 2 cars, were amazing, and both are driven on a regular basis. In fact the winning Bug-Eye was driven down from Sydney and last year around Tasmania. (Chris ended up in 8th place) This was followed by a Motokhana on bitumen, here we saw some very skillful driving. That night the theme was Black and White, so we had small time criminals, Darth Vader, Charlie Chaplin, Choir Boys, Yasar Arafat. Everybody had a go. Then we had a live skype video link call to John Sprinzel in Hawaii. We got him out of bed at midnight, but he happily agreed. Great Stuff. Then all the usual thank you speeches and results were dealt with.By this time we had our cars back on the trailer ready for the big drive after a good breakfast early on Sunday morning. In summary it was a great weekend, well worth the effort and expense, in fact it was excellent value for money. I really do hope more of our members make the effort to go to one of these events, it is so enjoyable, you meet so many great people. Many made huge efforts to get there. One WA couple shipped their Bug eye to Brisbane, then drove down and afterwards were driving it Melbourne, where it would be shipped back to WA. 4 cars came down from Queensland. Chris and myself would really like the Club to embrace this event as we know you would just love it. The Caire’s encounter today needs an appropriate caption. Please post your caption as a comment on the site after logging in. Best caption wins a prize at the next club meeting! Go to it! See “Parts for sale” page under Wanted for a new listing…might be time to upgrade that A Series? Easter Saturday saw the Unholy Trinity [Kevin, Garry and myself] make their way out North to Mallala to represent the Sprite Club at the Display at the track. John Whitburn decided to show up in this….. The lunch break gave the displayed cars a chance to have a few parade laps as the crowd ate lunch. Kevin promised to behave himself out there and duly did so. Thanks to Rose for her photographic prowess. Some of the pics are grainy..not sure why, but if you squint, they become a lot clearer! 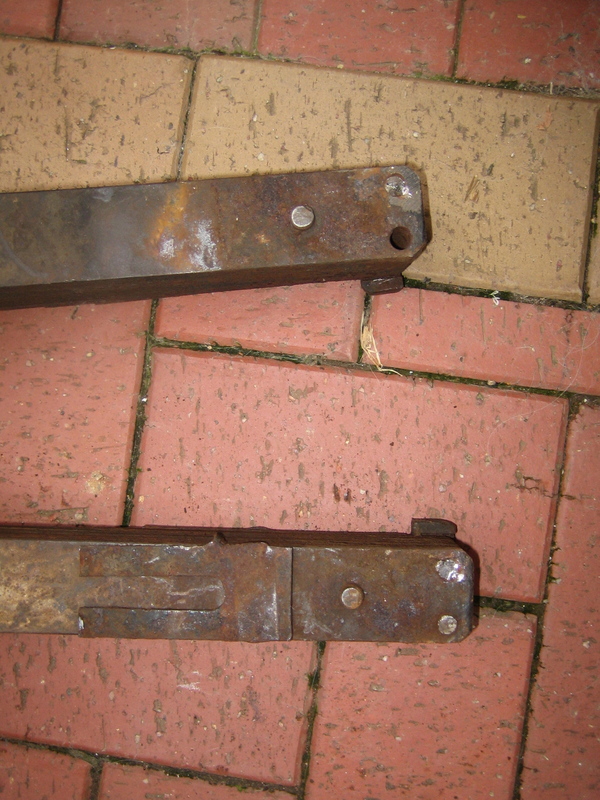 As many of you know I’m restoring a bugeye and at the last meeting I reported on the fact that I’d broken the heads of the rear spring bolts – however thanks to a tenacious cornishman (AKA John Whitburn) they have been successfully removed and the bugeye is now happly at minus paints! All the events for 2012 have now been published for 2012. Please take a good look as this the Club’s 40th. year. Take special note of the 5 ferries run in September. Apariently some members have paid their subs, but not filled in a membership form. So could they please download a form from the website and return it to the treasurer. Members still to pay your subs, please make sure you fill in your membership form when paying your subs. 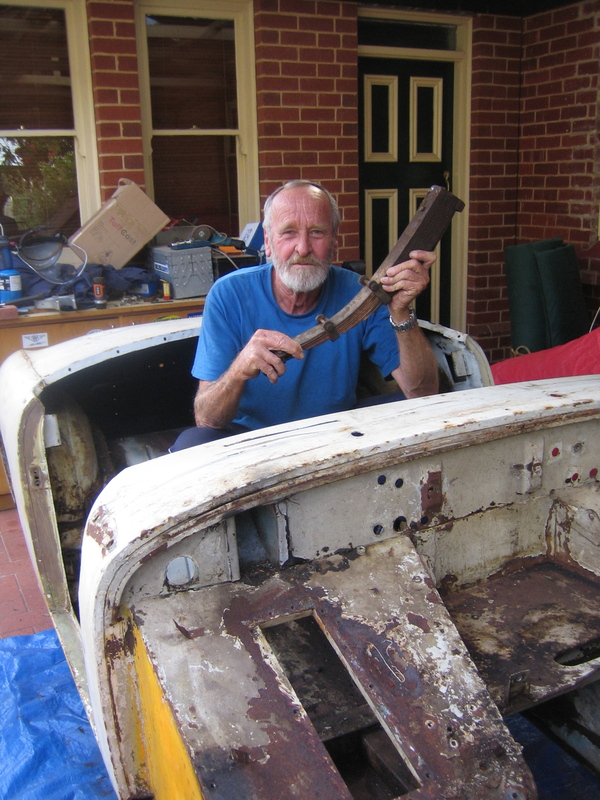 Gordon Boyce will be at the meeting from 7:00pm, so members wishing to have their cars inspected for Historic Rego, can do so prior to the meeting.